This hearty soup is hubby approved, and it’s actually pretty easy to make. It’s creamy, comforting, and so good! 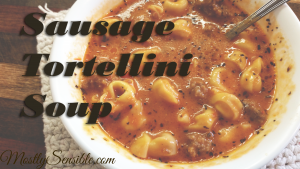 The base of the soup is the tomato parmesan, so if you don’t happen to have the tortellini or the sausage on hand, you could leave those out and it would still be a super yummy dish. I don’t usually have cream on hand, so I usually substitute that part of the recipe with a roux to thicken it up a bit (you’ll see that alternative at the bottom of the recipe). However, for a special occasion, the cream would add a richness to the soup that would be extra special. Also, for those of you with wild game in your freezers, the sausage can be substituted for ground bear meat. Bear is more oily than pork or beef, so it goes well with sausage seasonings (1 tsp. fennel seed, pinch of crushed red pepper or cayenne, 1/2 tsp. garlic, 1 tsp salt, 1/2 tsp pepper). Hint: I get my dried tortellini through Amazon’s Subscribe & Save Program . It’s the best price I’ve seen. By subscribing to at least 5 items each month you get an additional 15% off your item’s prices. Check it out! Combine the broth, tomatoes, and tortellini and bring to a boil. Reduce heat and simmer until pasta is just undercooked. Add remaining ingredients and simmer on low for 10 mins until all flavors meld together. Add 1/4 cup flour and stir until a paste is formed. Slowly add 1 cup milk, stirring constantly with a whisk. As the mixture comes to a boil it will thicken. Add more milk if it becomes too thick. Add this thickened sauce to the soup along with another 1 cup milk.